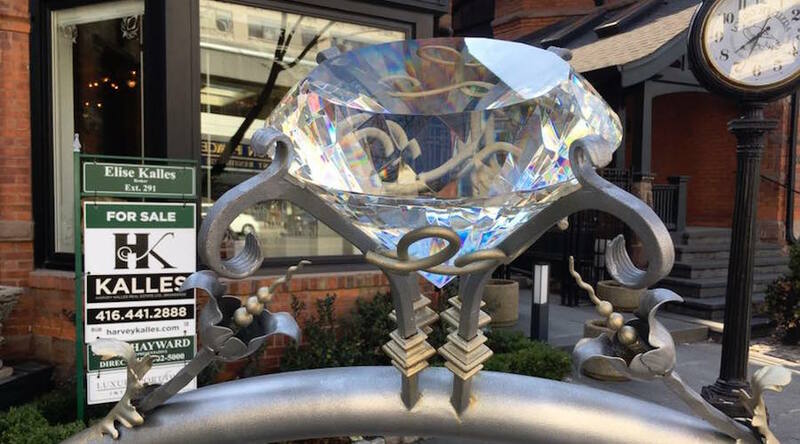 A crystal cut to look like a gigantic diamond solitaire sitting atop a large ring was stolen from outside Louro and Sons Jewellers in Yorkville, an affluent neighbourhood in Toronto. Surveillance cameras caught the moment when two people stole the 11-kilogram gemstone at around 1 a.m. Saturday. One of the men is shown pulling out the crystal from the statue holding it while the other one stands guard. Owner Louis Louro put up a $1,000 reward for the return of the piece and told the CBC he hopes police forces, already following the case, are able to capture the assailants. According to Louro, since its installation in December 2016 to commemorate the store’s 30th anniversary, the ring became an icon for residents and tourists. The businessman also said that just the crystal, which was sourced from Mexico, cut in California and then sent to Toronto, cost $7,000.